Description: Wheat beer is generally defined as beer brewed with malted or unmalted wheat making up 30 to 70 percent of the grist (grain) bill. Wheat imparts a clean, inoffensive grain flavour, unlike the many varieties of malted barley that contribute significantly to the unique flavours of beer. Due to wheat having higher protein than other grains like barley, the head is generally bigger and longer lasting than other styles - a distinguishing feature of most wheat beer styles. Wheat also contributes to a smooth, silky mouth-feel. Of wheat beer’s notable ingredients, yeast is the defining one in many of the best wheat beers. Most are brewed with a specific ale yeast strain, such as Hefeweizen ale yeast. With the yeast left unfiltered in suspension, the signature characteristics of wheat beers are the fruit-like esters, aroma and flavour compounds (phenols) produced during fermentation. Recommended Glassware: Weiss Glass, Pint, Mug, Chalice. Description: Refreshing wheat beers that can display more hop character and less yeast character than their German cousins. A clean fermentation character allows bready, doughy, or grainy wheat flavours to be complemented by hop flavour and bitterness rather than yeast qualities. Different variations exist, from an easy-drinking fairly sweet beer to a dry, aggressively-hopped beer with a strong wheat flavour. History: An American craft beer adaptation of the German Weissbier style using a cleaner yeast and more hops, first widely popularized by Widmer in the mid-1980s. Description: A pale, refreshing German wheat beer with high carbonation, dry finish, a fluffy mouthfeel, and a distinctive banana-and-clove yeast character. These are refreshing, fast-maturing beers that are lightly hopped and show a unique banana-and-clove yeast character. These beers often don’t age well and are best enjoyed while young and fresh. History: While Bavaria has a wheat beer tradition dating back hundreds of years, brewing wheat beer used to be a monopoly reserved for Bavarian royalty. Modern weissbier dates from 1872 when Schneider began production. However, pale weissbier only became popular since the 1960s. It is quite popular today, particularly in southern Germany. Description: Hefeweizen (also known as Hefeweissbier) – “Hefe” meaning “with yeast” and “weizen” meaning “wheat” – is the German-style wheat beer that is perhaps the most well-known wheat beer style. Hefeweizen is unfiltered and therefore cloudy in appearance, with a pale to light-amber colour. The yeast contributes to the mouth-feel and medium body, with yeasty esters evoking banana aroma and flavours, as well as the phenolic spiciness of clove and sometimes vanilla. Description: Kristallweizen (sometimes called Kristall Weissbier), is filtered after fermentation to remove yeast. The result is a crystal-clear weizen beer with no haze or clouds. Exhibiting aroma and flavours characteristics similar to Hefeweizen, Kristallweizen is generally perceived as more crisp and clean on the palate. Description: Dunkelweizen (sometimes called Dunkles Weissbier) – “Dunkel” meaning “dark” and “weizen” meaning “wheat” – is a moderately dark German wheat beer with a distinctive banana-and-clove yeast character, supported by a toasted bread or caramel malt flavour. Highly carbonated and refreshing, with a creamy, fluffy texture and light finish that encourages drinking. The presence of Munich and/or Vienna-type barley malts gives this style a deep, rich barley malt character not found in a Hefeweizen. 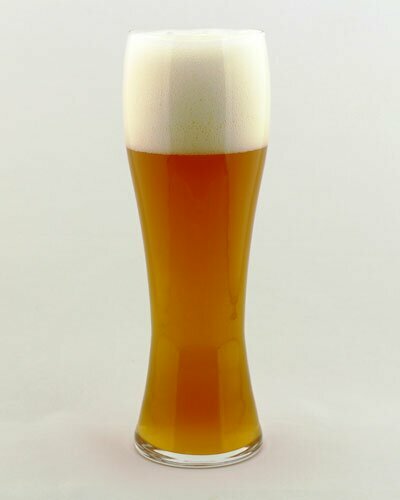 Description: Weizenbock (also known as Weissbock), is a strong, malty, fruity, wheat-based ale combining the best malt and yeast flavours of a weissbier (pale or dark) with the malty-rich flavour, strength, and body of a Dunkles Bock or Doppelbock.